Altinex, a manufacturer of Signal Management Solutions, has released its Muse HDMI+Power+IR Transmitter and Receiver, designed to change the way integrators approach AV systems. With the ability to distribute power, HDMI, RS-232 and IR control signals up to 300 feet (90 m) over a single, low voltage, shielded or unshielded CAT-6 cable, Muse enables AV Integrators to eliminate the worry of electrical outlet placement—providing AV installers full control over their projects. Consisting of the MU400-111 transmitter and the MU500-112 receiver, Muse products enable users to transmit video, display power, RS-232, and IR signals up to 300 feet (90 m) over a single CAT-6 cable. The Muse is powerful enough to power a 150 watt LCD display or LED lights. The actual power available to the load depends on the gauge and length of the cable. The Muse video distribution portion of the system is compliant with HDMI and HDCP standards and is pending safety (UL60950-1) approvals. The advanced features of the MU400-111 transmitter provide a safe and reliable way of sending both video signal and power over a single shielded / unshielded CAT-6 cable. The output of the MU400-111 transmitter is monitored for power consumption and when power is exceeded, the output is turned off to protect the system. The Muse is designed to withstand direct shorts both on the low voltage side and high voltage side. The current consumption is monitored continually and output is disabled if an overload or short is detected. The Muse can power a 46-inch to 52-inch display with a maximum of 150 watts power consumption. The Altinex Muse product line incorporates numerous advanced features to safely transmit power to a display. These features include: current monitor, auto shutdown, and auto receiver detector. The MU400-111 transmitter has a durable metal enclosure with a built-in temperature controlled cooling fan to provide years of trouble-free operation. The MU500-112 receiver operates without any fans so as to minimize noise on the display side of the system. The Altinex transmitter and receiver combination have a built in IR channel that facilitates sending IR signals from the receiver (display side of the system) back to the transmitter (source side) to control the AV equipment. This handy feature enables one, for example, to change the TV channel while viewing the display, regardless of where the TV receiver unit is physically located. This feature simplifies setup and provides convenience when AV equipment is hidden out of sight. 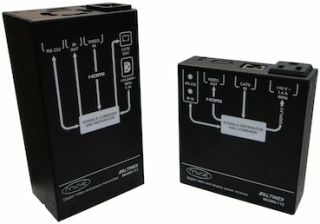 Additionally, an RS-232 connection is provided for bidirectional communication on both sides of the transmitter / receiver system. The MU500-112 receiver easily fits behind a monitor due to its small size and light weight—enabling integrators to easily hide the receiver from view, thus ensuring clean looking installations. The receiver’s metal construction and durable design provides reliable operation over a wide temperature range. The MU500-112 is powered by the Muse transmitter and provides both power and video to a display for a trouble-free installation.